Resinbound driveways are a welcome alternative to block paved driveways. At Cornerstone Paving Ltd, our team are fully experienced in using the new materials that create a stunning, flawless finish to your driveway. Many customers are choosing this new style as it is durable, virtually maintenance free and comes in an abundance of colours. The main reason our customers are choosing this option is that they can create really unique designs specifically designed for their space and to compliment their outdoor space. 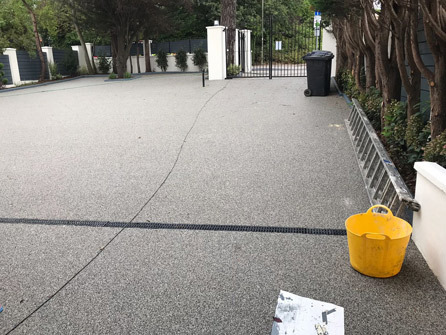 Resinbound Is a mixture of stone aggregates blended together with UV resin and expertly hand troweled onto the driveway and smoothed into place. Customers can choose either sharp or smooth aggregates and can even decide what size stones they want, according to what look they want to achieve. Single colours can be chosen or you can have a mixture of 2 or 3, again according to what colour theme you want to achieve, the options are endless. 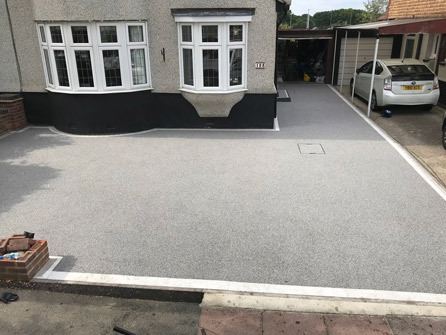 At Cornerstone Paving Ltd, we have a portfolio of completed driveways that we can show you, ask to see some resinbound driveways and see for yourself the stunning results that can be created. Our team can help you decide on which style, shape and colour of aggregates would work best for your home and its surroundings. We can install extras such as kerbs, walling, decorative borders and lighting to bring the whole look together. All of our driveways are fully guaranteed and we come fully insured. We offer free site surveys and free no obligation quotations. 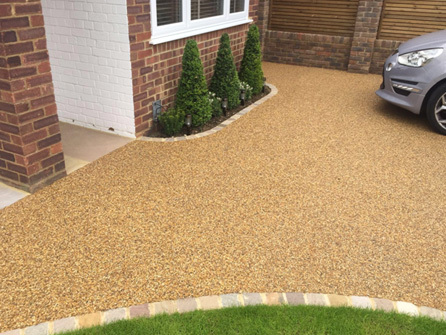 For professional advice on the design and installation of resinbound driveways call in the experts at Cornerstone Paving Ltd on 020 8485 8422.